2012 BMW X6 M50d review | What Car? The BMW X6 M50d is the first diesel model engineered by the companys M performance division to be offered in the UK. It's part of a new range that's meant to bridge the gap between M Sport trim and the fully fledged M cars, and uses a triple-turbo 3.0-litre engine that produces 375bhp and a massive 546lb ft of torque. All this goes through an eight-speed automatic gearbox, while a sophisticated four-wheel-drive system varies the amount of power being sent to the front and rear axles and each rear wheel to maximise traction. The benchmark 0-62mph sprint takes just 5.3 seconds, yet the M50d still averages a respectable 36.7mpg. Like other versions of the X6, the M50d blends SUV and coupe styling cues, although 20-inch alloys and huge front air intakes mark it out from lesser models in the range. What's the 2012 BMW X6 M50d like to drive? The three turbos kick in sequentially to give the engine a broad spread of power, and there are no obvious steps in its delivery, so the car is generally smooth and effortless to drive. Its slick-shifting eight-speed auto gearbox contributes to this easygoing nature, while paddle shifters let you change gear manually when you're in the mood. True, the 'box can be caught out if you suddenly put your foot down hard, but after a frustrating pause it kicks down to unleash awesome acceleration. The M50d also gets BMWs Adaptive Drive system as standard (it's a cost option on lesser X6s), which uses active anti roll bars to keep body lean to a minimum. It helps make the M50d incredibly agile for such a big, heavy car, although you pay for this with a ride that jostles you and your passengers over poorly surfaced roads. 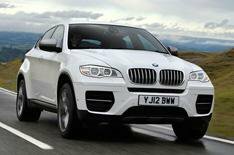 The engine is always smooth, but the X6's massive tyres generate a fair amount of road noise. What's the 2012 BMW X6 M50d like inside? The dashboard is well laid out and built from classy materials, although it's a pity it doesnt feel more special; you could be behind the wheel of any X6. Rear visibility also disappoints the rear screen is more like a letterbox slot than a window. However, there's loads of space up front and electrically adjustable memory seats contribute to a fine driving position. Things aren't so good in the back, because headroom is tight for six-footers and you get only two rear seats as standard (a three-person bench costs an extra 250). At least the boot is a decent size, and the rear seats fold down in case you need additional load space. Standard equipment includes leather upholstery, front and rear parking sensors, dual-zone climate control and self-levelling rear suspension, but its disappointing that sat-nav is a cost option. If you're after a reasonably efficient SUV and value performance and agility over practicality, the X6 should be near the top of your list. It handles better than rivals, such as the Audi Q7 4.2 V8 TDI and Porsche Cayenne S Hybrid, and is also more efficient. However, we reckon the xDrive40d model is a better buy than this new M50d; it's still insanely fast and costs almost 13,000 less.